This morning a 'Twitter poster' launched at London's Kings Cross station. 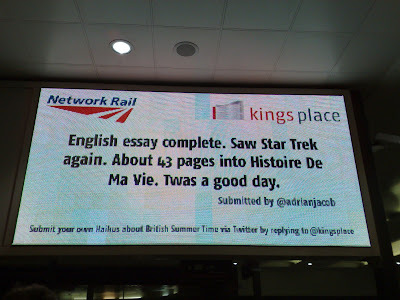 The Kings Place development (near Kings Cross) are allowing Twitter users to broadcast Twitter haikus onto the main Kings Cross digital poster site, in full view of the 110,000 daily passengers who pass through. Kings Place Twitter poems are submitted through Twitter by including @kingsplace in the tweet. The Kings Place Twitter poems will run across this week and the Twitter poster will update every 20 minutes. At the end of this week Yoko Ono and poet Jackie Kay will then choose the best three entries. I'm not sure about the creative execution, but the Kings Place Twitter poster is an interesting way of 'socialising' outdoor. Another demonstration that 'social media' is not a channel in itself nor about just doing something with Facebook - social thinking can be integrated into traditional media too and the @kingsplace Twitter poster is a good example of this. we should probably applaud them for trying but for me this is a case of a media owner getting excited about using technology because they can - rather than because it is particularly welcome or useful for anybody. The fact you have to add a #kingsplace tag to your message takes the random sense of serendipity out of it (for understandable legal reasons) - you know that every message up there wants to be up there and for me you lose something straight away. Most twitter updates are, by their very nature, banal. Which is fine if I choose to follow you but it's quite rude to expose me to your banality in public in my view. I would actually argue that in trying to be "social" this actually tips over to being anti-social. Yes you're sharing your update with the world. No, we're not interested thanks. that sounded quite grumpy on reflection didn't it? Yes it did sound grumpy! Getting a dedication read out on the radio, having a letter published in a newspaper or the more recent text the TV and we'll scroll your texts on screen - same kind of principle, making things more engaging and interactive. 'Tweet this poster' is just a new way of doing it! I agree that the execution could look better but I think there's something quite appealing about tweeting your creativity and thinking it might then get in front of Yoko Ono and onto a massive billboard somewhere! I wouldn't group your examples together - for the simple reason that I don't think that all interaction is necessarily always engaging. Radio dedications are only a small part of the content, they add to the sense of community which is important for radio ("people like me" are listening) and they don't fundamentally change the editorial all that much as they tend to just play a song they would have played anyway. Newspaper letters (you would like to think) go through a very strict editing process (for reasons of having finite space) and are often thought provoking and / or entertaining for that reason. Plus they have a very real tangibility about them which remains important to many people. I struggle to see the value add that #kingsplace provides for the average person. In fact I would actually group it together with viewer opinions on the bottom of rolling news. At best irrelevant, at worst quite annoying. As ever I should say thank you very much for pointing this out and being on the button with new developments - it's just that this execution does nothing for me. As you say yourself though, it's all in the execution. There may be situations where this genuinely adds value to people. But this certainly isn't it! Thats true that twitter being widely approved at the social level makes greater contribution to social network.